A strong upper ridge with strengthening high pressure system dominates the Arctic region and N Atlantic while two upper lows are further south. One low is centered over the Baltic region with surface front extending towards the E Balkan peninsula, is a focus of interest for convective weather. Another larger upper low sits over the west-central Mediterranean and brings another day of widespread convective activity for much of southern Europe. SLGT risk has been issued for parts of S Italy, Ionian sea into S Albania and WSW Greece with threat for severe storms, capable of producing severe winds, torrential / excessive rainfall and marginal hail. Good overlap of 500-700 J/kg of MLCAPE with quite a strong shear should support organized storms. A better helicity along the SW Greece could also enhance some tornado threat. 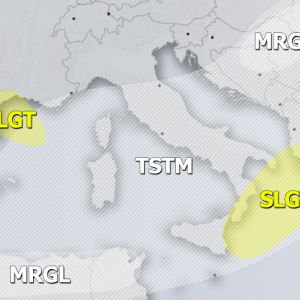 SLGT risk has been issued for extreme S France and E Pyrenees into NW Mediterranean for severe downslope non-convective winds, locally in excess of 90-100 km/h. MRGL risk has been issued for E Croatia, E Bosnia and N Serbia into NW Romania with an isolated threat for severe storms due to good CAPE overlapped with marginal shear, so slow-moving storms could bring hailstorms with decent accumulation and local flash floods from the torrential rainfall. MRGL risk has been issued for N Algeria into N Tunisia with threat for isolated severe storms, capable of producing severe winds, heavy rainfall and marginal hail. The only partial overlap of instability and shear precludes a higher threat level as favorable shear is well ahead of better instability further north. TSTM risk areas have been placed where convective storms are likely to occur but should remain sub-severe.